(NewsUSA) - Many of America's military veterans struggle with injuries and disabilities. Scuba diving might not be the first therapy that comes to mind to help these individuals, but data support the value of scuba diving for improving the physical and mental health of people suffering from conditions including post-traumatic stress disorder, traumatic brain injury, and chronic pain. 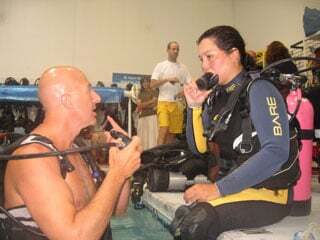 Diveheart, a nonprofit organization founded in 2001, provides adaptive scuba training to volunteer divers and instructors, and offers unique opportunities in zero gravity to veterans and others with a variety of disabilities. The Diveheart motto, "Imagine the Possibilities," reflects the positive attitude of the organization and the hope and healing it offers. A subset of the organization, Diveheart Military Wounded focuses specifically on introducing veterans with physical and mental disabilities to the benefits of scuba therapy. On the physical side, scientific research and the personal experiences of veterans show that water pressure and the feeling of weightlessness can relieve physical and mental tension as well as chronic pain. "The weightlessness kind of helps my body release itself," says Coast Guard veteran Kevin Cozzie in an interview with the Daily Herald, a publication based in suburban Chicago. "I can feel it when I get out of the water." Ian James Brown, an Air Force veteran who was injured in the line of duty, returned to scuba diving after his injury through a Diveheart program. "I discovered scuba again," he says in an interview on the Diveheart website, diveheart.org. "I was able to integrate skills I thought I had lost," such as the regulation of breathing and balance, he says. "It made me challenge myself a bit more." Mr. Brown, who suffers from chronic neurospinal pain but has chosen to forego medication, "felt this euphoric feeling," and realized that he was "living pain-free for the first time in 11 years," during an extended dive in Cozumel. The mental health benefits of scuba diving are as valuable as the physical. Veterans who have participated in Diveheart programs report that learning new skills, gaining confidence, and bonding with other veterans who have experienced similar challenges create a sense of community and empowerment. For many disabled veterans, scuba diving helps them realize the possibilities rather than focus on their limitations, according to Diveheart founder Jim Elliott. Diveheart relies on volunteers and donations to help provide adaptive diving and scuba therapy experiences at no cost to participants. Visit diveheart.org for more information about the way scuba diving can change veterans' lives.